How Can You Maintain Your Louvers? Maintenance of your louvers is easier than you may realize. As durable as louvers are, they are not simply invincible. Like many things, louvers require proper care and maintaining, but nothing too complicated that would make you dread having to maintain your louvers. They need a watchful eye to be on the lookout when the time comes for maintenance to be done on them. But, how exactly do you maintain louvers? Well, here are a few helpful hints. At least once a year, or depending on your location, more frequently, your louvers will require inspection to make sure all is well. When conducting these inspections, make sure to check that all screw fixings are firmly in place. Then, whenever the handle connectors are used, check to see any pins, links, clips, or pivot points are secure and free from wear and tear. Also check to see that all louver blades freely operate, and that seals are in place and clean. Thanks to their durability, you will not have to worry about their being much weather damage, as they are made to stand up to whatever the weather might throw their way. However, some damage can still occur from simple landscaping fixes. If attempting to rid yourself of ay weeds or plants growing near your louvers, make sure you are doing so either by hand or with a handheld trimmer to avoid possibly damaging the louvers. It is also good practice to make sure you are keeping away and stones, bricks, pots, or any other landscaping objects you may have as they run the risk of damaging your louvers. Depending on what kind of weather your louver will endure, will determine how often they may need cleaning. Typically, they will only need to be cleaned every three months. To properly clean your louvers, remove all loose deposits with a wet sponge, then use a mild detergent in warm water to clean the louvers frames and blades. Well cleaning, make sure to avoid any cleaning supplies with a caustic base, abrasive materials or chemicals that can affect the aluminum surfaces. Car polish can also be used to add an aesthetically pleasing finish that will make their sleek design even easier on the eyes of anyone that walks by. Fortunately while cleaning, you will not have to worry about any rust on your louvers coming from the water, since the aluminum will not rust. When you are ready for quality aluminum louvers, the professionals at Hercules Custom Louvers are ready to help. 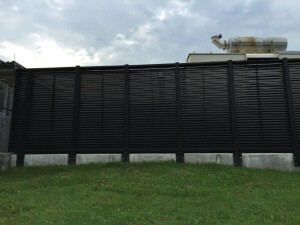 For more information and to learn how we can meet your custom louver needs, contact Hercules Custom Iron online or giving us a call at 1-800-331-2590. We will ensure your investment serves your family for years to come! For updates and to see projects we’re working on, visit us on Facebook, Twitter, LinkedIn, YouTube, Google+, and Pinterest. This entry was posted on Friday, February 2nd, 2018	at 2:43 pm	. You can follow any responses to this entry through the RSS 2.0 feed. Both comments and pings are currently closed.